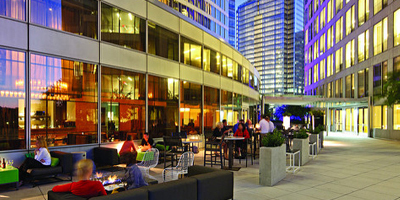 Located on the ground floor of Le Meridien Arlington and open for breakfast, lunch and dinner, Amuse Terrace offers breathtaking views of Washington, D.C., and the Potomac River. It has comfortable, lounge-style furniture and fire pits. Order off the Amuse restaurant menu or try their bar menu, which features more substantial fare as well as treats like house-made potato chips, deviled eggs and flatbreads. Visit website. 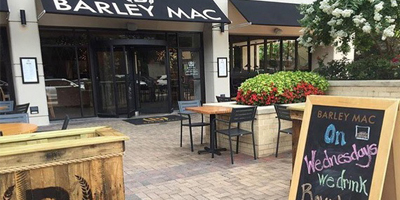 Located just a few blocks from the Rosslyn Metro, Barley Mac brings a love of delicious food, whiskeys and bourbons to the Arlington restaurant scene. They offer innovative twists on American comfort foods and boast an extensive specialty liquor menu sure to please cocktail enthusiasts. With an industrial chic interior, plentiful seating and a large bar area, Barley Mac is an ideal drinking and dining choice for groups of all sizes. Their outdoor patio seats 100. Visit website. 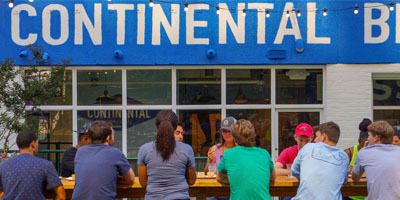 Continental Beer Garden is a great place to sip German and local Virginia craft brews while enjoying a chef-created menu with foods great for sharing. 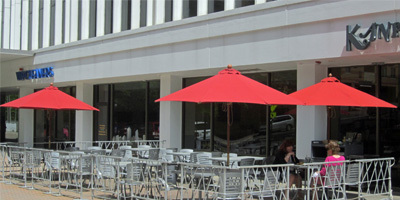 The outdoor seating area features long picnic tables and comfortable lounge furniture, while a smaller indoor seating area has space for 30. 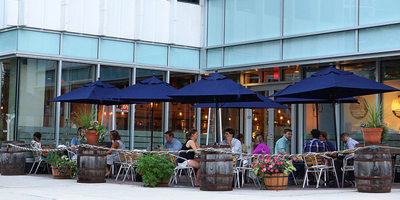 The beer garden also has a bocce court and wonderful string lights that illuminte the space after dark. Visit website. Heavy Seas Alehouse is located near the corner of North Oak and 18th Streets and has a spacious, shady terrace on a quiet neighborhood street. They offer an array of specialty beers and cask ales, including eight Heavy Seas beers from their brewery in Baltimore, Md. Pair them with their menu of boldly flavored dishes for a perfectly balanced meal. Visit website. Kanpai is a family owned and operated restaurant that has been part of the neighborhood for years. They bring in fresh fish daily for sushi and sashimi and also serve an assortment of great cooked food. Most of their weekday lunch specials feature an entree (including sushi), soup and salad for $10.95 or less. 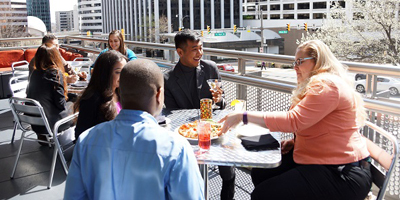 Sit on their outdoor patio to catch up with a friend or host a business lunch. Visit website. Key Bridge Terrace (KBT) is a great spot for an outdoor meal or after-work happy hour, which is available weekdays from 5-7 p.m. and features some delectable food specials, such as Korean-inspired short rib tacos, a pulled jerk chicken sandwich and pimento arancini. Their new spring bar menu includes an expanded wine list and a beer list featuring local microbrews. With space for up to 75 guests, KBT can be reserved for private events. Visit website. Serving upscale American cuisine, including award-winning sushi, Kona Grill has a sleek, modern bar that opens onto an outdoor dining area that’s frequently abuzz with lively groups. Take advantage of some of their regular specials, including ½-price bottles of wine every Wednesday, early and late-night happy hours, and all-day happy hour on Sunday. They also have what may be the best price on a martini in the D.C. area! Visit website. Piola offers simple, authentic Italian cuisine in a casual environment. Thin-crust, brick-oven pizza anchors the menu but pasta, salads, meats and homemade desserts are also available. 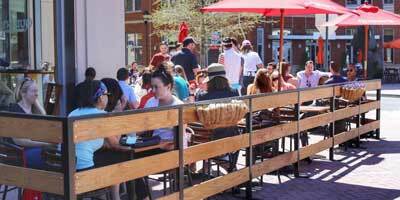 Their outdoor dining area offers a great spot to people-watch during happy hour. You can also dine outside during their popular weekend brunch, featuring unlimited pizzas and small plates for $24.99 and fresh fruit prosecco and house sangria for 99 cents per glass. Visit website. 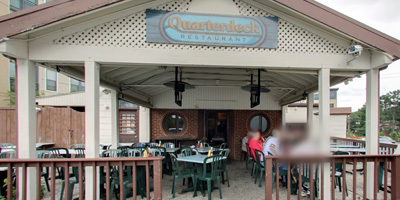 A fixture of the Fort Myer Heights neighborhood for over 30 years, Quarterdeck is a great casual spot to enjoy a pitcher of beer with friends and classic American fare, such as burgers, steaks and seafood. Quarterdeck is best known for its freshly steamed Maryland blue crab feast, served when in season. Visit website. 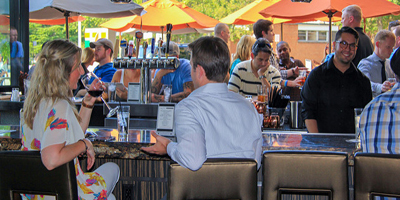 A popular neighborhood bar, Quinn's on the Corner has a terrific outdoor patio where you can munch on their tasty wings and other high-quality bar fare while sipping a Killer Cocktail of the Month, a beer or a refreshing wine frozée. 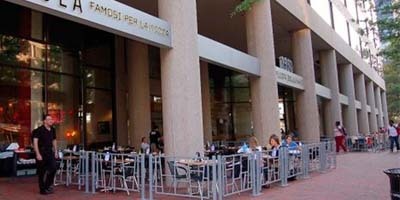 It's also a great spot for weekend brunch, available 10 a.m. to 5 p.m. Saturdays and Sundays. Visit website. Photo at top: On a quiet, tree-lined street, the outdoor patio of Heavy Seas Alehouse is a great spot for happy hour or dinner with friends.